Zippy tis havin’ a time! … no incriminating beer photos were submitted – huh? 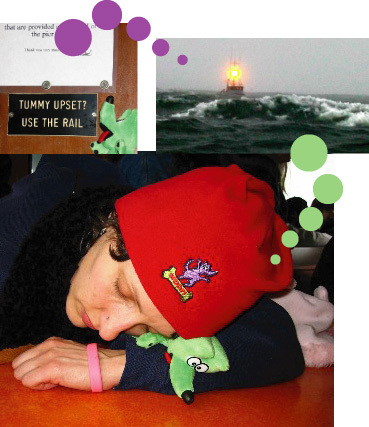 Considering the photographer – we suspect what happens in Irish pubs, stays in Irish pubs. First photo is Zippy in front of the Atlantic Ocean in County Kerry on the Ring of Kerry in the Southwest Coast of Ireland. The second photo is Zippy in a window at the Blarney Castle in Blarney County Cork where I kissed the Blarney Stone. We are watching for sharks! 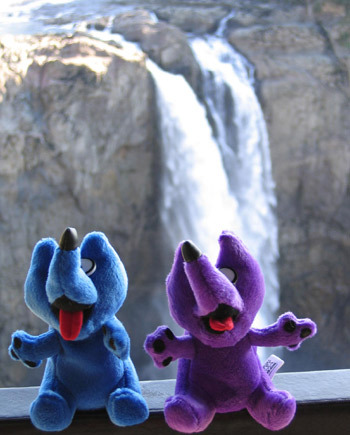 Elise, Kelli and Zippy took a quick weekend trip to Snoqualmie Falls just 20 miles east of Seattle. The weather was gorgeous and the falls were less than spectacular. Normally at this time of the year (March) with all of the mountain snow run off, the falls are huge. With no snow this winter we are looking at a hot and dry summer. To all you Washingtonians reading this … Zippy says please conserve water!! WOOF! Zippy’s first adventure on the high seas took place off the coast near Gray’s Harbor aboard the Neddie Rose, a 65′ whale-watching vessel. Dark clouds dotted the sky as the boat left Wesport in search of migrating gray whales. A storm blew in from the southwest, throwing the Neddie Rose back and forth and causing Zippy to seriously consider the sign posted in the cabin. Out of pity, he spent the remainder of the 2.5hr trip comforting his seasick companion, which was just as well as the whales did not see fit to show themselves. It was certainly an adventure that Zippy will only repeat on a calm dry sunny day when the whales are not napping. In February 2005, Elise and Kelli (ZippyDogs owners) took a vacation to sunny Puerto Vallarta, Mexico. 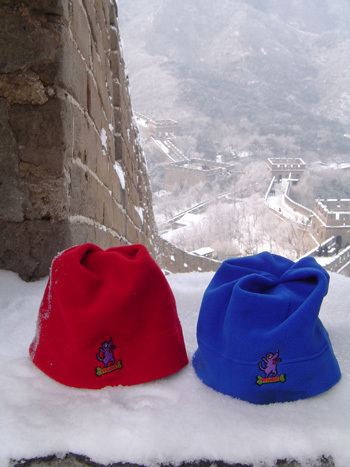 Knowing about Zippy’s most recent trip to the Great Wall of China, courtesy of our book keeper Maureen, we took Zippy with us. 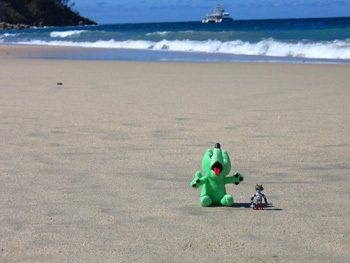 The photo above shows Zippy enjoying a day on the beach with our other travel buddy Griffey. Griffey is our traveling alien and has been all over the United States and the world. Where has your Zippy been?